I’ve wanted a better smile for a while now, and I think I’m finally ready to commit to getting orthodontic treatment. The thing is, I’m an adult and I work in a profession where my appearance matters. I know Invisalign is an option for this and clear braces are as well, but which one is better? Would you recommend Invisalign or clear braces? How wonderful you’ve decided to improve your smile through orthodontic treatment! While I can empathize with worrying about starting treatment, I promise that once you finish, you’ll be glad you did – nothing makes you more confident than being truly proud to show off your smile when you walk in a room. You’re not alone in seeking an inconspicuous option for orthodontic treatment, and you’re right that both Invisalign and ceramic (clear) braces offer great options for this. Both of these treatments are less noticeable than traditional metal braces, but they do so in different ways and have unique advantages and disadvantages. The first thing to understand is that Invisalign and ceramic braces are fundamentally different treatment options. The mechanism they use to move the teeth is different. Ceramic braces use much the same technique as metal braces, relying brackets cemented to the teeth and an archwire running through the brackets to align them. Invisalign, on the other hand, uses a series of clear, removable orthodontic aligners to straighten the teeth. This means that the treatments aren’t identical in terms of visibility. 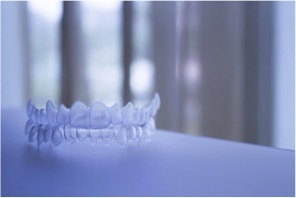 To put it simply, Invisalign is a more discreet option: the aligners lay flat against the teeth and are completely see-through, so they’re difficult to notice to outsiders who aren’t explicitly looking for them. With ceramic braces, the brackets are clear, but you’ll still have a metal archwire running across the teeth. That said, Invisalign isn’t right for every orthodontic patient. While it’s the best treatment option in many cases, Invisalign isn’t as powerful for treating issues of jaw alignment. So for certain patients, ceramic braces will be a necessary choice for orthodontic reasons. Still, we use Invisalign extensively at our office, and we can use it to treat the majority of adult patients. If you’re looking for the most discrete option, Invisalign may be your best bet – but if you want a more durable, reliable treatment, ceramic braces also offer an inconspicuous choice. No matter which you choose, though, you’ll be putting yourself on the path to a gorgeous new smile.